Storytelling is all about reversals, and we humans are drawn to them like crazies to the Bachelor house. Tatooine farmboys became intergalactic heroes. Greek kings accidentally marry their mother and fall from grace. And in real life, we are totally gripped by famous people falling flat on their face at the same time that we love a good comeback story. These reversals of fortunes are at the heart of good storytelling. Characters find fame, crash and burn, then find redemption, and maybe crash and burn again, and maybe get back on top again. So why is that image is funny? 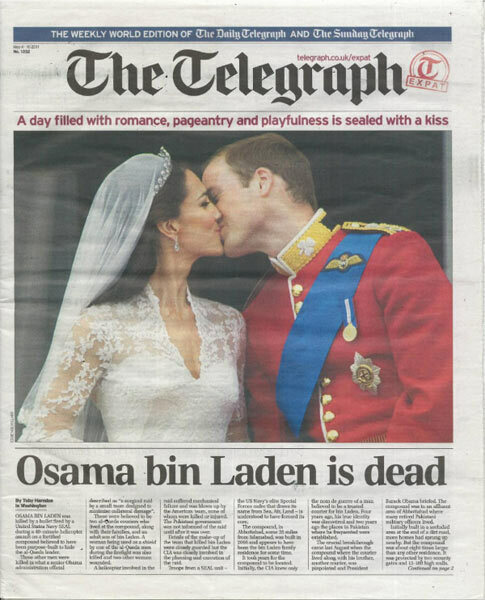 It’s the abrupt shift from romance and pageantry to OSAMA BIN LADEN IS DEAD. Or that Kate and Will are celebrating something different than we thought they were. Maybe both. Either way, as our eyes move down the page our brain registers the shift. That transition from up to down or down to up and having our expectations upended is at the heart of storytelling. Similar to what I outlined in the post on dynamic character relationships, the arc of a character should follow a path of ups and downs. A good reversal can jar your reader and grip them with the drama. So you see, Luke has a pretty consistent series of reversals between up and down moments throughout the narrative. He also has the one major reversal in Star Wars, which is a transformation from a farmboy to a hero. Reversals reversals reversals! On a scene to scene level, from a beginning to the end of a novel/movie level, and on a series level. Plot out those reversals and you’ll have yourself a gripping story. Exactly. I call them disasters. End a scene with some sort of setback. Even if a scene ends well from time to time, which it should to avoid predictability, use the good to lead to more disaster. Example: Kimble helps the boy in the hospital in TheFugitive. Saves his life. But it leads to his getting caught by the nurse and security getting called. In so many words, it sounds like the lives of most people I know! Absolutely the heart of storytelling – but I can honestly say I'd never thought of it that way. Thank you. And I definitely LOLed at that front page. I couldn't agree more, Mr. D.
Excellent advice. Something I really needed to hear because it's so easy for me to get caught up in the small technicalities of writing that I lose sight of the big picture! Thanks! You lost me at 'Star Wars' but I get the general idea! This seems like common sense, and I suppose it is, but I've never seen it described so succinctly. Star Wars references/comparisons or even mentions always do help, though. Good point and good examples. Great post! I like JSB's scene-by-scene disaster, but a lot of these reversals are happening on a higher scale. I think it might be a good idea to go through my own work and make sure the characters are in a vastly different situation every 20 or so pages—the result of reversals! Excellent post! Especially with all the Star Wars references. Interesting… my post this week prescribes a pending reversal on the Death Star. Hm, I was wondering why my work in progress felt like an endless slog through a flat plain of depression. I think I need more up moments. Thanks! Thanks! This is great. Nice… my MS however, is mostly downs… farther and farther, with a half up at the end. Bleak, for sure, but it's a war story (not a farmboy war story either, though there are farmboys in it :). Thanks Nathan! Good post and it's very helpful! Oh, love this post! I just finished The Underneath and Kathi Appelt did a wonderful job of reversals! Mention Star Wars and I'm hooked. Those science fiction stories had most of us glued to our seats watching the drama unfold. With the aid of special effects, drama is magnified. It's so much more UP when the bad guy gets it in a spectacular way (used often in thrillers). Thanks, Nathan, posts like this remind us that a little unpredictable action is always a good addition to the mix. We must keep that character moving, he has to get to the end of the book. Nathan – couldn't reversals also be considered transition points, where the plot can thicken or divert? Man, you are funny – 'like crazies to the Bachelor house' – LOVE IT. I applaud you for using Star Wars to create this point (which is really, really valuable!). In high school, I had to watch Star Wars in conjunction with the Odyssey as an example of strong storytelling and a quest story. I love seeing this movie referenced as such. When I'm explaining plot to non-writers, I use crime shows to describe the reversal. It's that moment right around the 30 minute mark when they suddenly realize the guy they thought did it… didn't. New evidence comes into play, he suddenly has an alibi, another murder occurs that changes the whole story–for some reason, the entire case is turned upside down, and the cops are sent back to the drawing board. Now I have a new analogy. Thanks, Nathan. A wonderful and helpful post as usual, Nathan! I also think that characters' reactions to reversals in fortune are just as important as the reversals themselves. I've been working on making my plot reversals grow out of character actions and reactions, so that they seem organic rather than forced. "Like crazies to the Bachelor house"
Thanks for using Star Wars as an example. It's such a good one. Jim Bridges, a movie director, once told me that there was only one business in Hollywood: Building people up and then tearing them down. Cynical, but true. I guess that;s what most humans like to see. Helpful should be your middle name. I needed this. Love you Nathan! (like a brother (a brother I don't know very well)). Thanks for the great advice. I've seen Star Wars used in other storytelling examples, it's an excellent choice. I believe it's used in Chris Vogler's The Writer's Journey: Mythic Structure for Writers as an example of 'The Ordinary World', 'The Call to Adventure', etc. A book every writer should have in their library, imho. This is so true. Isn't this the basis for all of the will-they-won't-they romantic storylines? It's the roller coaster that keeps us interested and invested in the story! Good article, Nathan! I like the way you conceptualized it. I've seen you do this before, deceptively simple and very clear thinking. Thank you! I don't really like the headline on the news article, though. Wow…talk about spoilers. Guess I can take these off the netflix queue since I now know the ending. Very enlightening! Lately I've been thinking about advice from some other writers, like Vonnegut, that you have to make things worse and worse, or at least more difficult, for your characters before they can have their happy/satisfying resolution. Thing is, I don't think their advice necessarily contradicts yours. If you give a character up moments, it makes the downs all that more dramatic; the same happens if each down raises the stakes, as it does in Star Wars. Love the analogy and the thoughts! Loved this post, Nathan. You did a stellar job of illustrating the principle with The Star Wars film. I'm particularly impressed with each of the trilogy ending in the reversal pattern. I never really noticed that point. Sigh. Think I need to look at my ms again. This sort of thing keeps happening. Well done advice. GREAT post! You're so right, but I never thought about actually plotting out the reversals. And you're right that having them in layers – scene to scene, book to book – makes a huge difference. Can you ever have too many? Is there such a thing as reversal overload? So true–you hardly have a plot without reversals, just a bunch of characters on the page. And a great example, too … Star Wars always wins. Just when I think I'm alone in the fact that I relate everything to Star Wars, you come through for me, Nathan. Thank you SO much for this post. My story really needed it. Now I'm going to look for reversals everywhere.